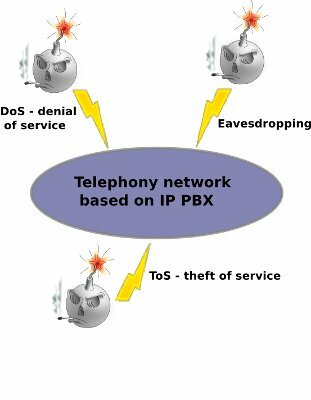 This article gives you insight to some VoIP problems for an IP PBX such as theft of services, denial of services and eavesdropping and presents specific security problems that may happen in FreeSentral. Problems such as those mentioned above have a great probability to occur in every IP PBX. These problems are severe security issues and their consequences affect the functionality of the IP PBX. A network attack that keep users or devices from accessing the network is a denial of service(DoS). Such attacks are inevitable and are almost impossible to avoid because of their changing nature. Eavesdropping is a form of hacking for obtaining names, passwords and telephone numbers. This leads to gaining control over the voice mail, call plans and other features. The theft of services is a direct consequence of eavesdropping. Service theft is another serious security issue that implies hacking the system and using IP PBX services by unauthorized users and/or stealing its' services. The issues above are just few of the IP PBX security problems. You can avoid some of them by increasing the network security level. The first step is to verify the extension and/or the IP. If those are recognized by the IP PBX as belonging to the network, then the call is authorized. But if you need, for some reason, to allow anonymous calls, FreeSentral will check if the caller ID or IP is recognized by the server (known extension, group or DID). This is a useful technique when wanting to prevent DoS or service theft. To see the protections added in Freesentral for this issues and how you can protect your network continue reading the below points. Web access for users is secured by using https. The number of failed logins is unlimited so they can try to login until they succeed. You can see the failed attempts in the Logs section. Admin's password is very important when wanting to properly secure the system. If the admin's account is broken into, then the hacker can easily create new accounts and/or use Impersonate for existing accounts. The first thing you should do it's to change the admin password. When exporting extensions the passwords are exported unencrypted. It is very important that the files containing these informations not to fall in the hackers' hands. This could break in a major security problem. In case an user account was breached, the majority of the theft of service attacks result in a high number of international/expensive calls being made from that account. Freesentral includes protection for this attacks. In case specified limits for international calls are passed international calls are disabled and all international calls are rejected until administrator enables them again. Read more about this here. Another possible attack uses the IP PBX's gateways. Malicious hackers can take control of the gateways and use them to make free phone calls. This situation can occur if �Trusted� is enabled for the VoIP provider. For better security, support for TLS connections between Freesentral and SIP gateways was added. To use it, set Transport to TLS when defining a gateway. To cope with DOS attacks a global script: banbrutes.php was added that drops traffic from ip address that send to many requests. In order to use it you need to run yate as root and have iptables installed on the server. The �Logs� section lists the users' names, their actions and also the changes made by admins and users. See the screen shot in �User access�. A common mistake when analyzing existing security problems is to overlook problems created by the OS distribution. If the operating system is vulnerable then the IP PBX is vulnerable. A weak OS security system will surely be easy to pass when a laborious hacker has just that in plan. 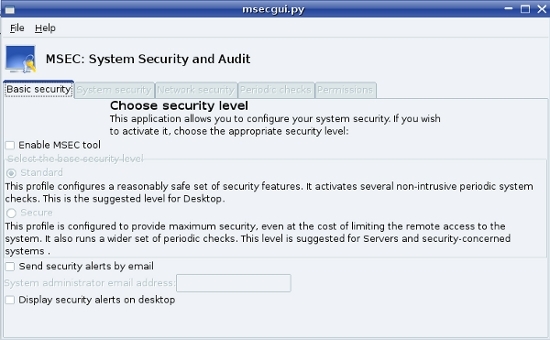 As you can see, msec detects the security level. 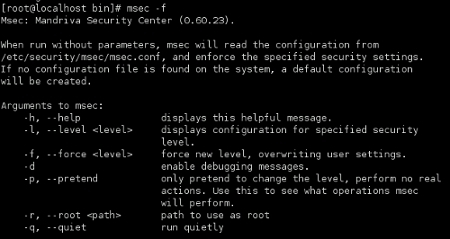 Setting the level is directly connecting to enabling/disabling msec. In the capture below notice the MSEC tool is disabled. The network architecture, the security protocols used, the users interaction and the OS distribution have a huge impact on the way FreeSentral works. You may as well give free access to everybody if just one of these is ignored, inaccurate analyzed or improperly configured.